I’ve written before about how much i like Company. 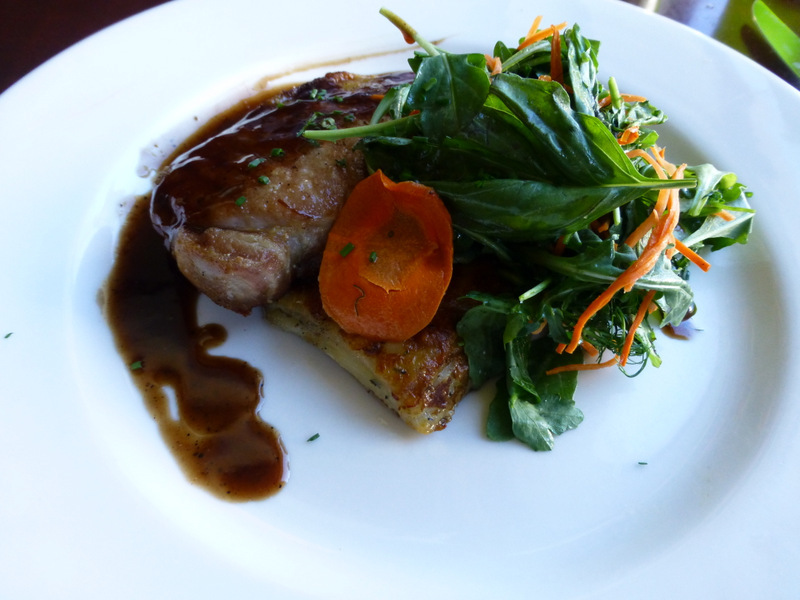 I loved it the first time i ate there, but it just keeps getting better and better as Karen, the new chef, continues to add fine new dishes to the menu as she reaches her stride. 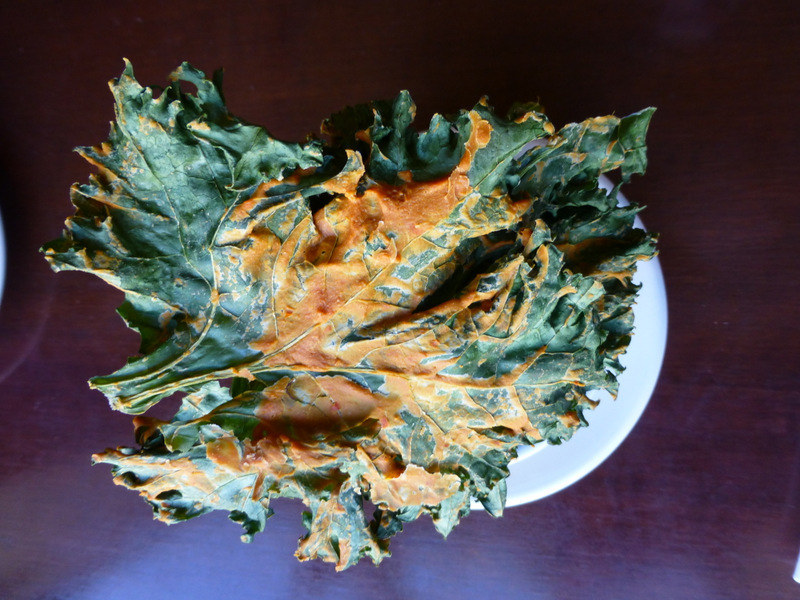 She’s keeping some old favorites like the kale chips. I ate there last Sunday with April, and we started by splitting a couple of new menu items, the house cured salmon with roasted beets and pickled citrus, in which the salmon snuggled up nicely to the beets, and the zucchini blossoms stuffed with goat cheese and battered and fried, which made me realize that i’d been missing a great treat by being unclear that squash blossoms were edible. And then for entrees we split the grilled mahi mahi, which was very tasty, and the pan seared chicken with farro, grilled peaches and pancetta vinaigrette, which was done to absolute perfection, moist and tender with a crust that made April exclaim. For dessert, we split Karen’s Tcho chocolate custard with hazelnuts and whipped cream. Bless April, she took only the one small bite permitted by her diet. All that merely whetting my appetite, i went back last Tuesday with Jeff and split the stuffed zucchini blossoms and the confit chicken wings with tomatillo salsa verde and Fresno chiles. 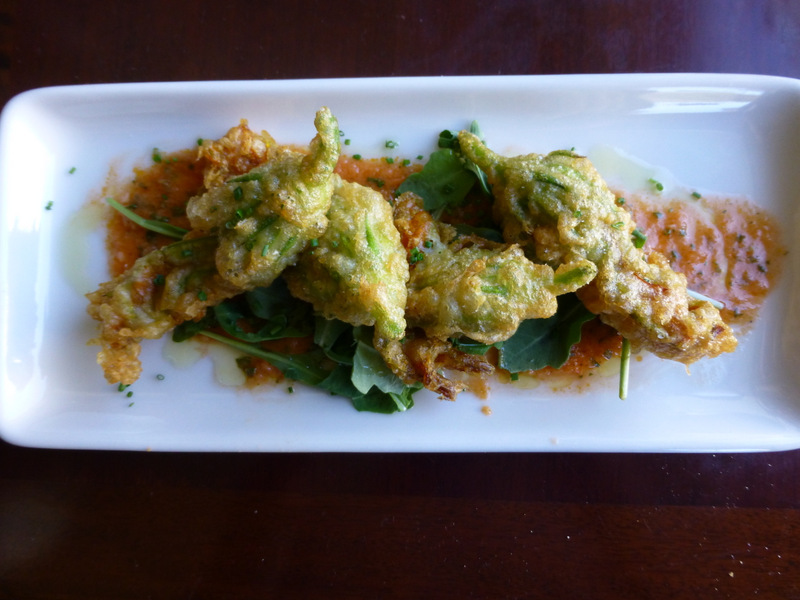 I hadn’t known i liked squash blossoms, stuffed or otherwise, but i sure do love Karen’s. 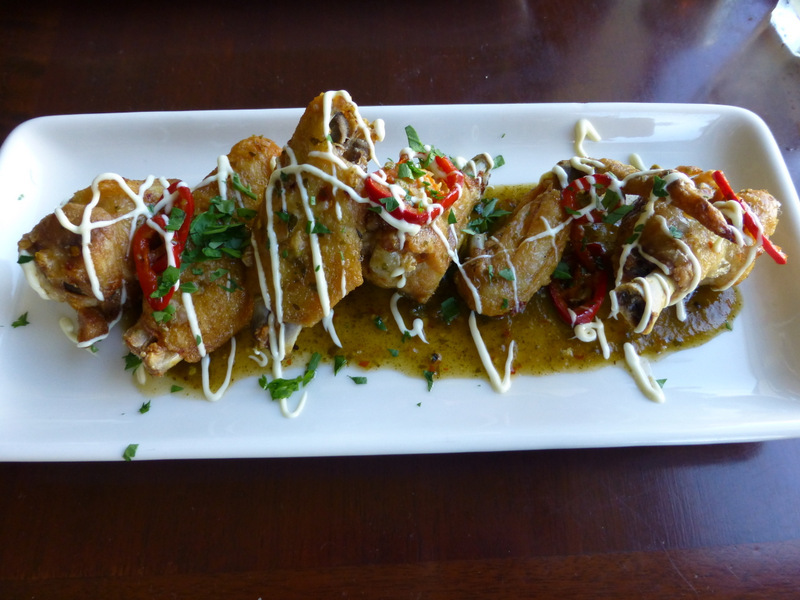 And i can’t get enough of those confit chicken wings, almost creamy on the inside and crisp on the outside. We also had cups of a fine kale and mushroom soup to set up the entrees, the grilled swordfish with Romesco and olive tapenade, which was sublime, and the pan-seared pork loin with kohlrabi-potato gratin and herb salad, which i’d been eyeing on the menu for a while and discovered was even better than i’d imagined, tender and moist and set off superbly by that gratin and salad and with a rich sauce that i’m thinking is some kind of au jus reduction. To conclude the meal, we decided to split the Meyer lemon tart with raspberries, but Karen comped us with an experimental item she’ll be putting on the menu tomorrow – she’s calling it a Warm Chocolate Brownie with Vanilla Bean Ice Cream, but what it tasted like was a large square of Reine de Saba Torte so dense and rich that it needed the ice cream as a foil. OMG, what a wonderful end to a fine meal. If you’ve tasted Karen’s Meyer lemon tart, you can never go back to the traditional lemon tart. But what you can do is go back to Company. Over and over. And order those two desserts, ideally there being two of you so you can split ’em and not risk dying at the table of a carbohydrate overdose.